Welcome to the land where you'll need a crowbar to get a drink of water. In the Yamal tundra, you need to travel at least 20 kilometers to see another person , and when the polar night begins, you get no more than four or five hours of daylight. You spend most of your time in darkness, and if you want a cup of tea, you’ll have to go to the lake and break some ice to take home. To melt it and boil the water, you need to chop wood and stoke the potbelly stove in your chum. Alexandra Terekhina and Alexander Volkovitsky, two anthropologists from St. Petersburg, spent a year roaming the tundra of the Yamal Peninsula with a family of deer herders. They left the big city for the tundra to pursue Alexandra's dream: To go on a long expedition and truly immerse herself in the life of the people she is studying. These young researchers were welcomed by a Nenets family, the Serotettos: Konstantin and Albina (aged 33 and 34) with their six children and Konstantin's elderly parents. They keep a herd of 300 deer and pasture them on the vast territory from the south of the Yamal Peninsula to the shores of the Kara Sea, covering a distance of over 500 kilometers a year. A deer herder's routine depends on the annual cycle of the deer, so the Nenets are the most perfect example of nomads in Russia. A winter day of kaslaniye, or moving the camp, starts at five in the morning. The lady of the house is the first one out of bed: She "boils the kettle," as they say here, and fills the thermoses with tea. Then the family of herders and the two researchers meet at breakfast for tea and bread with butter, fish or meat – leftovers from last night's supper. Everyone starts packing by the light of their torches and lamps. Albina and Alexandra put clothes and necessities in the yukhuna – a sledge pulled by deer. Meanwhile, Konstantin and Alexander set up the corral, a semicircle of 8–12 sledges, and herd the deer into it. Once everyone's things are packed, the chum is broken down: The covers are pulled off, the frame is dismantled and the poles are loaded on the sledges. When the chum has been packed up, the yorkolava begins: The reindeer are herded into the corral, and the argishes, the sledge caravans, start off. Konstantin, the master of the household, leads the way. 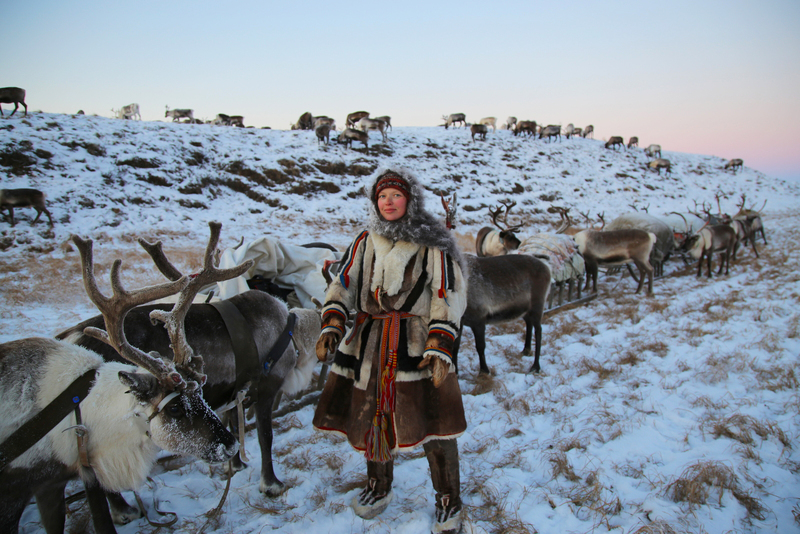 Alexander Volkovitsky says that the leading role in a nomad family always belongs to the man, called khasava in Nenets; the word also translates as "the lord of the tundra." In fact, the true lord of the tundra is the deer. Not only does it enable man to survive in the harsh conditions of the tundra, but it also provides the freedom to travel anywhere you want. In good weather, a deer can move at a speed of eight or nine kilometers per hour, enabling its master to cover a distance of 20–25 kilometers a day. In winter, a blizzard can start when the chum has already been packed and the deer have been harnessed. However, if the animals have run out of lichen, which is their primary food, the Nenets attempt to move the camp, regardless of the blizzard. Deer are the basis of their way of life and their only assets. So a herder's ultimate priority is the comfort of his herd. Five hours later, Konstantin sees a suitable place for a new camp. He stops the caravan, gets off his sledge and sticks his khorey, the pole used for steering, into the snow to mark the future location of his chum and to announce the end of the journey. After a cup of hot tea from their thermoses, the families pool their efforts to set up the chum, and the women get down to their tasks. The last of the daylight fades away. In pitch-black darkness, with only the flickering light of torches and kerosene lamps, Albina and Alexandra carry their ice-cold belongings in from the sledges into the chum and make up the beds. Then they light the stove: It works best if the stove was filled with firewood at the old camp to make the process faster. Alexander and Konstantin shovel some snow against the covers of the chum on the outside to insulate it against the wind. After all the work has been done, the families dine with stroganina (slices of frozen fish or meat) or any other food that can be cooked quickly. Deer herders sometimes boil or stew meat, but mostly, they eat it raw. For people of the tundra, raw meat is an important source of vitamins. Among the old-school Nenets, it is considered inappropriate to stay in the chum while the sun is up. The list of jobs to be done includes fetching firewood and water. Alexandra takes a large canvas sack and a spear-shaped iron bar with a wooden handle; Albina takes an ax, and they head for the lake. At the lake, Alexandra smashes some ice and fills the sack with it, while Albina looks for a large crevice and chops large slabs of ice from its sides. The chopped ice is loaded onto a big sledge and pulled to the chum. Firewood is the other essential resource for deer herders in winter. In winter, birch logs are delivered to local firewood supply stations. The locals arrive on snowmobiles with sledges and chainsaws to collect the logs. Families that live far from the station stoke their stoves with the wood of dwarf willow trees. However, dwarf willows don't grow in the same areas as deer moss, so women have to travel 8–10 kilometers away from the camp to cut them down. A common sight at the camp is a five-foot-tall ikebana made from firewood of all shapes and sizes, fenced off for protection from the deer, who love scratching their antlers against it. City dwellers can hardly imagine going for days without a shower. However, clean hair is not a priority when you’re constantly on the move and your supply of firewood and water is limited. If there’s enough firewood in winter, the Nenets can heat some water on the stove to wash their hair and underwear. The researchers brought a stock of wet wipes with them from St. Petersburg to use during the expedition. "The tundra manates a completely different attitude to personal hygiene; everyone changes their habits in these conditions," says Alexandra Terekhina. "In the tundra, people hardly ever take a bath in winter, but they wash their faces every day." Before lunch, bread is brought from the sledge in advance and put by the stove to defrost. In the tundra, a fresh loaf of bread is a delicacy, and savvy guests remember to bring it as a treat. After lunch, Alexandra teaches the Nenets children to read Russian letters, to draw and to work with clay. On this expedition, she is not just an anthropologist, but also a teacher at the nomadic kindergarten. After supper, the long-awaited leisure time begins: Adults and children all gather together to watch movies. Many modern deer herders have TV sets, satellite dishes, laptops or tablets. Over a few evenings at the camp, the Nenets and the researchers watched all the episodes of ‘Star Wars.’ Konstantin's elderly parents had a lively discussion about the characters of the seventh episode, ‘The Force Awakens,’ nicknaming each of them in Nenets: Guess who was dubbed "Khariko" (the Big-Eared One), "Tartsavey" (the Hairy One) and "Paridena Nyleka" (the Black Villain). After evening tea, everyone in the chum goes to bed, covering themselves with warm yagushkas – women’s garments made from deer fur, both inside and outside. If there is not enough moss for the deer around the camp, the nomads will have to wake up at five in the morning the next day and pack one more time. But if the new location is good, they might spend up to a month there before it is time to move the camp again.